Getting a Job as a teacher in a Kendriya Vidhyala is a Dream for every graduate students and for those who wish to get a job in the teaching field. KVS Recruitment Examination is the only gateway to get a job as a primary teacher in any government School or KVS. KVS invite the 1900 Applications for posts of Trained Graduate teachers. Aspirants who have recently applied for the post of KVS TGT. They definitely want to know more about the KVS TGT Job Profile. So Throughout the article, we will provide you with the detail information about KVS TGT Job Profile and KVS TGT Salary Offered. 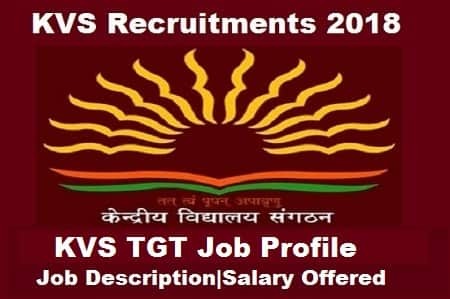 The KVS TGT Recruitment Examination will be conducted by KVS Recruitment Authority to appoint talented and deserving Teacher in Central Governments Schools or KVS. Once you pass the KVS, you are eligible to apply for primary teachers and TGT posts in Central Government Schools such as Army Schools, Central CBSE Schools/KVS, and Navodaya Samithi Schools. Let’s have a brief look at the KVS TGT job profile. sir i m bsc with zbc i.e zoology botany and chemistry… so plz tell if i have to solve physics and chemistry questions ..? Whether bsc biotechnology students eligible for kvs tgt post? u need to be a B.Ed and CTET qualified…only then u can apply for this job. Iam b.sc chemistry graduate with physics and maths as combined subjects and not zoology and botany ..I’ve completed b.ed and cleared ctet paper 2 ..please reply if am eligible or not..
Sir,mai psychology se graduation kiya h b.ed s.st se 6-8 ctet v clear ki . kya kv s.st apply kr sakti hu?kya subject problem aayegi?